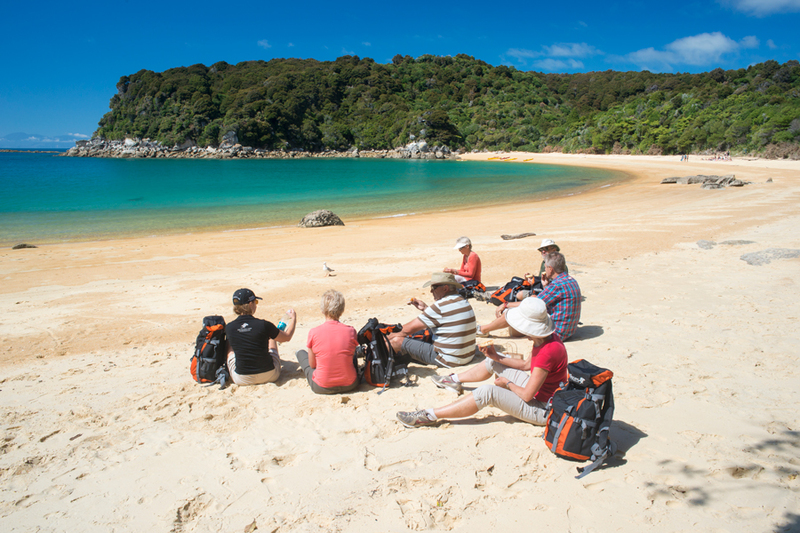 A park for all seasons, Abel Tasman National Park is spectacular year-round. 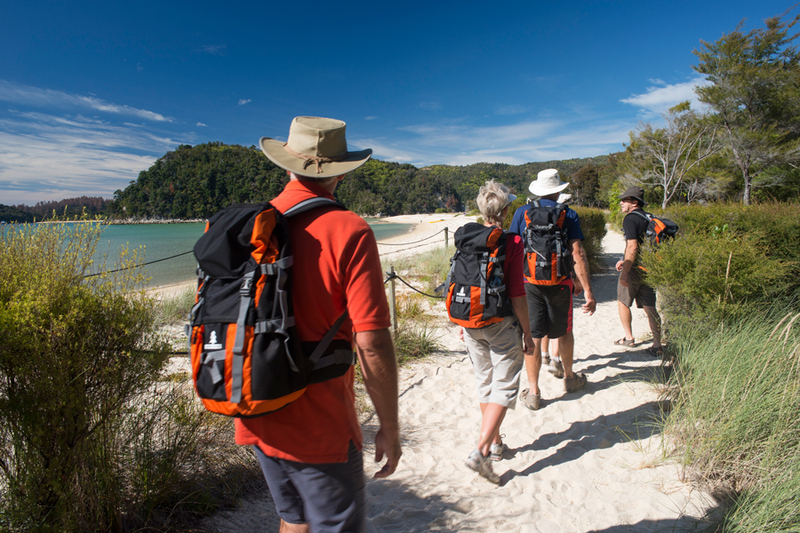 Sling on a day-pack and head out to meet paradise where gentle, evergreen beech forests give way to golden sands and glistening water with Wilsons Abel Tasman. Here, sunshine is in endless supply and the only sounds are made by azure waters. Only one day in Paradise? Travel in style on the fast, safe, comfortable Vista Cruise to the beach of your choice. Relax or take a walk (options below). Time ashore varies depending on scheduled boat service chosen. Enjoy comprehensive commentary to introduce you to this fascinating coast. 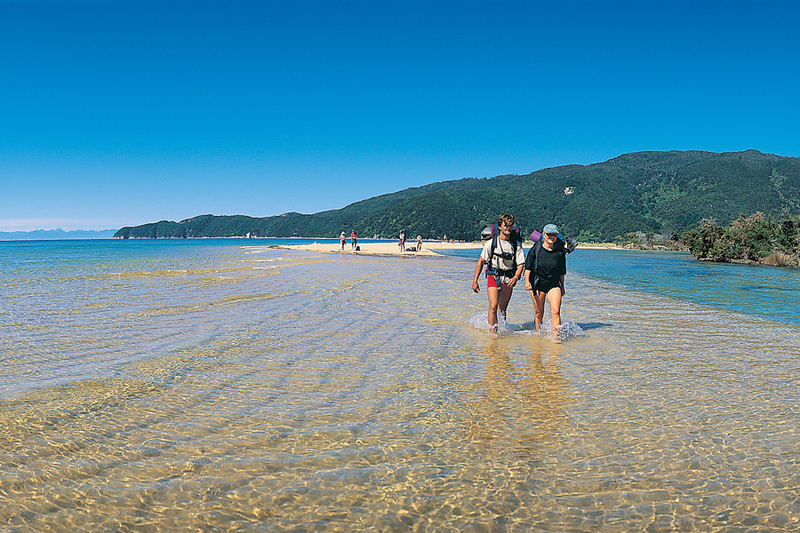 Golden sand beaches, native forest, spectacular coastal views and swimming opportunities in calm, azure waters feature on every walk in Abel Tasman National Park. No need to take a full day. With three Vista Cruise sailings and two Vigour Water Taxi sailings per day (October to April), you can enjoy a Cruise & Walk in the morning or afternoon (reduced timetable May to September). Departures from Kaiteriteri with bus connections to Motueka, Nelson and Marahau. Choose from one of the three locations where you are dropped and picked up at the same beach. Ideal if your group includes different ages, abilities and interests. After a sheltered water cruise through the Astrolabe Roadstead (45 minutes), take a walk from the long golden sands of Anchorage Beach to one of the most picturesque beaches in the park – Te Puketea Bay. Return walk 45 mins or 1 hour 30 mins depending on the track you choose. Cruise into the heart of the park at Medlands Beach (1 hour) then walk the forested waterfall trail around the stunning Bark Bay inlet, including the new swing bridge by the falls (1 hour walk). Cruise into the Northern reaches of the park to Awaroa Bay (1 hour 45 mins) then relax or go beachcombing through the largest tidal inlet on the coast. Option to book lunch at the Awaroa Lodge & Cafe (additional cost). Travel in style and comfort aboard the Vista Cruise into Tonga Island Marine Reserve. Pause to view the antics at Tonga Island Seal Colony then land at the historic Tonga Quarry Beach. Walk over a forested saddle and around the Bark Bay waterfall trail, crossing the new swing bridge beside Bark Bay Falls. Take some extra time to relax on the golden sands at Bark Bay beach before you continue on to the picturesque Medlands Beach. Travel in style and comfort aboard the Vista Cruise into Tonga Island Marine Reserve. Pause to view the antics at Tonga Island Seal Colony then continue along the remote northern beaches where nikau palms and native Rata (the South Island Christmas Tree) feature in the rainforest. Turn around a the long, burnished sands of Totaranui, the Vista Cruiser returns you to historic Tonga Bay Beach to start your walk. Then walk over a forested saddle to Onetahuti where a unique board walk and bridge, designed by local Maori iwi leads onto the golden sands of the beach. Walk along the beach and continue on to picturesque Tonga Quarry. With your guide, walk over a forested saddle to Onetahuti where a unique board walk and bridge, designed by local Maori iwi leads onto the golden sands of the beach. Walk along the beach and continue on to picturesque Tonga Quarry. 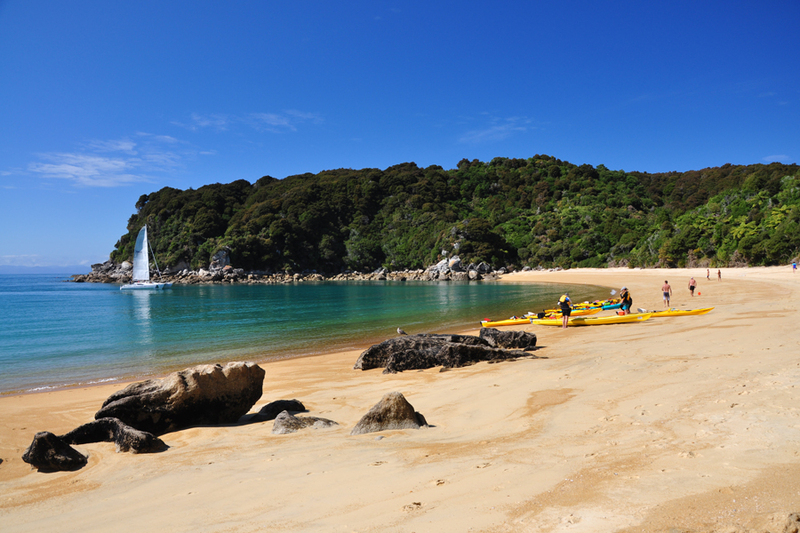 Take the 9.20 am Vista Cruise or 1.00 pm Water Taxi service from Kaiteriteri to Torrent Bay for a tidal landing on the beach. Then walk 7 kms (4.4 miles) along the coastal track through lush, dense forest and across the Falls River Swing Bridge to Medlands Beach. From Kaiteriteri, cruise into the heart of the National Park. Disembark at idyllic Medlands Beach & walk to the long golden-sand beach of Anchorage, via Torrent Bay, cross the spectacular swing bridge at Falls River (3.5 – 4 hours 9.5 kms). Allow extra time (30 minutes return walk plus time to relax beside the pool) to take a short side track beside a crystal forest stream to visit tranquil Cleopatra’s Pool. 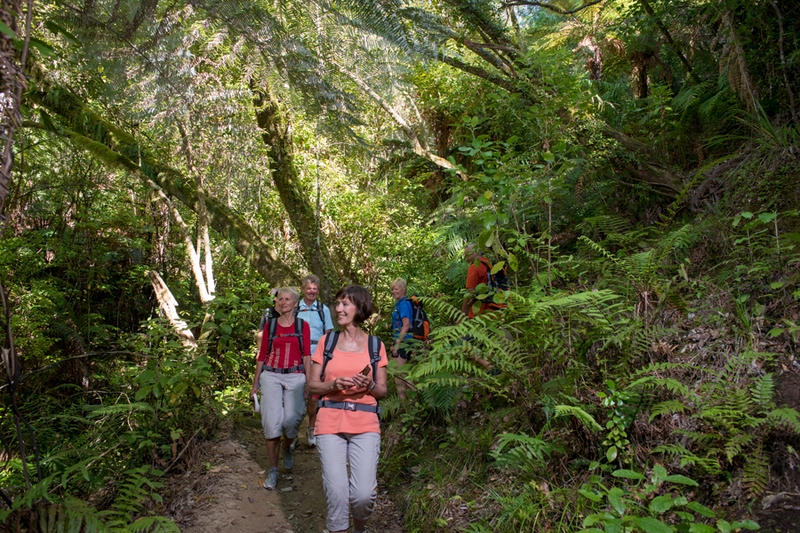 If you are feeling energetic, you can add up to 1.5 hours walking to Te Pukatea Bay, return. 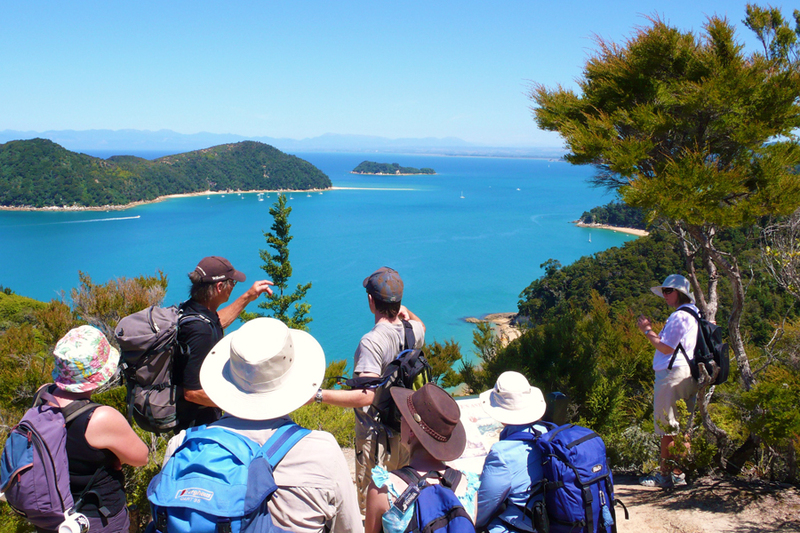 Take the Vista Cruise into picturesque Medlands Beach to walk the southern section of the Abel Tasman Coastal Track. This walk is for fit hikers who would like a long, active walk. The coast track from Medlands Beach to Anchorage is the most interesting and varied section. From Medlands to Torrent Bay (7 kms), the track weaves through sunny groves of Manuka and fern between breathtaking views of the granite coast and lush gullies of mature forest, to reach tranquil forest pools. Cross the rushing Falls River by an impressive swing bridge. Walk around the stunning Torrent Bay (approx. 4 kms) and allow an extra 30 mins to take a short (500 metres) side track beside a crystal forest stream to visit tranquil Cleopatra’s Pool. Rejoin the boat at Apple Tree Bay to return to Kaiteriteri. Take a scenic cruise into Tonga Island Marine Reserve, pause to view the antics at the resident Seal Colony then land at Awaroa. Then, walk over a forested saddle to Onetahuti where a unique board walk and bridge leads onto the golden sands of the beach. Walk along the beach and onto Tonga Quarry to explore evidence left from the historic granite quarry. Finish your walk here or continue over the Tonga Saddle and around the Bark Bay inlet with its new swing bridge, along the waterfall trail for a pick up at Medlands Beach. Cruise through the sheltered waters of the Astrolabe Roadstead to disembark at Anchorage Beach. Then, you can choose to relax or take a walk to Te Pukatea Bay. Facilities at the beach include a shelter, picnic tables, flush toilets and filtered drinking water. Cruise to Medlands Beach in the heart of the park, then relax or take a walk to Bark Bay (10 mins) and further along the Waterfall Trail to the new Swing Bridge. View the fascinating Tonga Island seal colony before disembarking at Awaroa. Choose your style of lunch (cafe – additional cost, bookings required or picnic lunch) and relax with the views or explore the panoramas of the largest inlet on the coast. What to Wear: Bring a warm layer of wool or polar fleece and a light rain jacket (cotton clothing especially denim is not recommended), comfortable footwear, sunscreen and camera. Snacks and drinks are available to purchase on board the Vista Cruise. A substantial, delicious picnic lunch can be ordered the day before travel for an extra cost, from $15 – 35 per person. Kaiteriteri waterfront, Kaiteriteri, Abel Tasman, New Zealand.